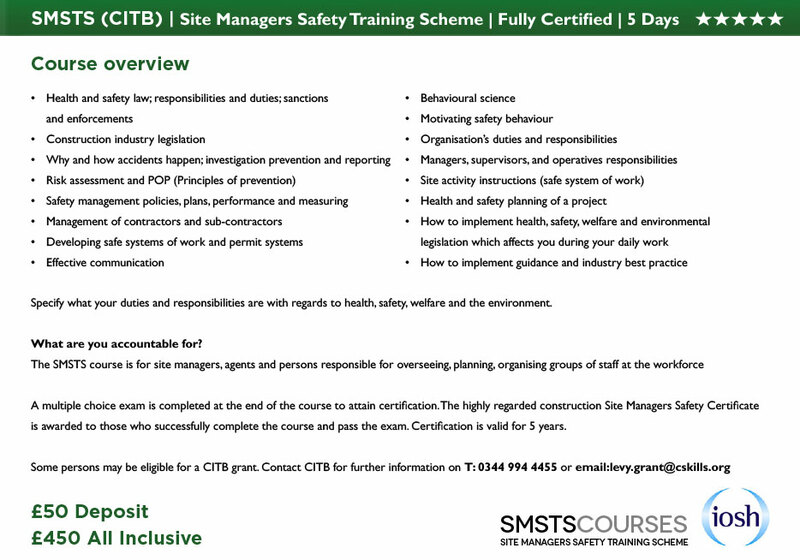 SMSTS trainings have become increasingly more popular as Scotland’s construction industry explodesWith more and more major construction projects being undertaken all over Scotland in the last few years, the need for proper Site Management Safety Training Scheme (SMSTS) courses has absolutely exploded in that same amount of time.Delivering the kind of high quality safety and quality training for site managers, construction agents, and other high-level management personnel – as well as those in risky positions all throughout the construction industry – these kind of trainings have been designed from the ground up to make sure that everything is being approached in a systematic and Safeway.What exactly are the SMSTS Glasgow, SMSTS Scotland, and SMSTS Edinburgh programs supposed to do?Basically designed from the ground up to give your critical personnel the insider information they need to manage health and safety on each and every job site (in accordance with all of the necessary local legal provisions, rules, and regulations), each and every one of these SMSTS programs is a live training that cannot be underestimated.Giving your managerial and supervisor positions all of the information they need (cutting edge information that they may not have picked up all on their own) as well as a systematic way to treat each and every safety issue on all construction projects, this is the kind of training that you must implement as soon as possible.Live courses are the backbone of each and every SMSTS Glasgow and SMSTS Edinburg trainingWhile there are certainly some printed manuals, visual aids, and online aspects to each and every SMSTS Scotland service, the real essential component to this entire training are the life courses conducted by Construction Site Managers. Each and every one of these professional Construction Site Managers will work through the entire full five-day course, disseminating all of the essential information to your key team members and making sure that they are brought up to speed.Not only is there going to be classroom like instruction at every SMSTS Scotland training, but there will also be live question-and-answer sessions, hands-on trainings, and even a number of role-playing situations where your team members will get the most immersive training possible.End of course examinations are critical for completion of the SMSTS Glasgow and SMSTS Edinburgh trainingsHowever, it’s critical that you understand that these trainings are not just five-day vacations for your supervisors, managers, and other key personnel. No, these are incredibly intensive experiences that will be tested at the conclusion of the five-day system – and a passing grade will be required before your team members will be given their certifications. Each and every examination lasts right around 30 minutes (and must be completed within this timeframe), with a 72% mark being required for a passing grade.If you’re serious about making sure that your construction team is moving forward under the right safety standards, you’re going to want to implement the different SMSTS Scotland trainings just as soon as you possibly can. Contact their office and your earliest convenience, and set up a system right now. SMSTS Centre courses take place monthly at the Jury’s Inn Hotel and Conference Centre. The centre is well connected; Glasgow Central Station is a stone throw away. The centre also offers free parking for students. The centre is ideally situated for those living near Glasgow and the surrounding areas. You will be taught by the best and highly qualified teachers in the country to ensure you have an exceptional learning experience. SMSTS Centre recommends using Google maps to search the most convenient transport and directions to the Jury’s Inn Glasgow SMSTS centre.